Visit the most dangerous path in the world, Caminito del Rey, at the hands of one of the best hotels in Spain and Andalusia, Malaga. Tiburón Boutique Hotel in its continuous search for services for the most intrepid travelers who, apart from the atmosphere of the city, the sun and the beach, look for outdoor emotions, surrounded by nature and love the risk this experience offers the opportunity to visit the most dangerous path in the world in competition with hotels in the Caminito del Rey in Malaga. 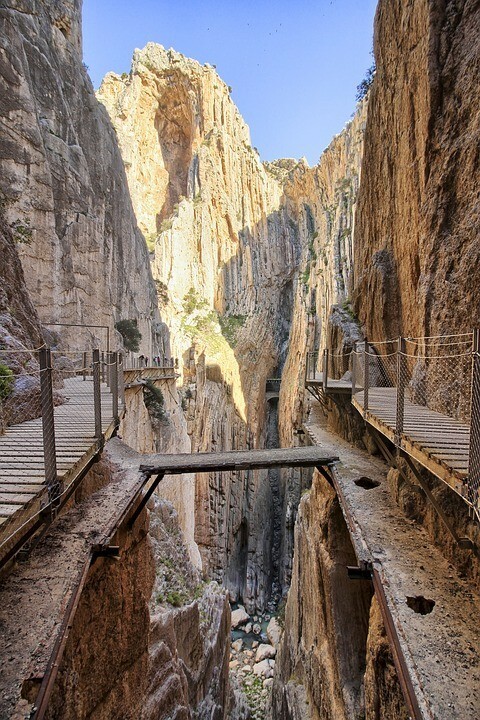 Caminito del Rey: The most dangerous path in the world. El Caminito del Rey is a catwalk in the Gaitanes gorge, between the municipalities of Ardales, Álora and Antequera, in Málaga, Andalusia. It is a pedestrian passage of more than three kilometers, attached to the rock wall inside a spectacular canyon, with sections of just one meter wide, and up to 105 meters high on a river, in almost vertical walls of vertigo. Over time he suffered many deteriorations. Most of the route had no railing and there were ruinous sections, only with the support beam. Several hikers trying to cross it several years ago died in the attempt, which earned him a certain black legend. But in mid-2014 they began their rehabilitation, installing a new wooden footbridge throughout its journey. In just over a year, in 2015, restoration work was completed and in March of that same year it could be reopened for the public. Its reopening caused great expectation that has lasted until today becoming a world-class tourist destination. If you want to know more about the Caminito del Rey you can visit its official website or ask us any questions at our hotel. Why live the experience at boutique hotel Tiburón and not at others hotels in Caminito del Rey. Caminito del Rey is located less than 45 minutes from the hotel, so in a little more than half a day you can get there and take the whole route along the path. Once finished you can return to the hotel to continue enjoying the stay. And, for example, spending the rest of the day on the beach enjoying the sun and the Mediterranean Sea and the famous beach "La Carihuela" is less than two minutes walk from the hotel. Without leaving Torremolinos you can also enjoy the promenade integrating into the environment, or stroll through the old town of Torremolinos and enjoy its varied leisure offer. Visiting nearby Málaga, less than 7 minutes by car and very well connected by public transport to see any of its museums, its varied cuisine or any of its shows. Making a visit to another tourist town of interest. Since the privileged location of the Hotel, allows you to travel to coastal towns or the interior in a short time to make the most of the time that your stay lasts. Once back at the hotel, the experiences are not necessarily terminated. You can live more relaxed moments, enjoying the pool area, its solarium or its jacuzzi. Delight the senses on the terrace overlooking the sea, a chill-out moment in the Hotel's Lounge Bar, or the gastronomic dishes that the Paris Tokyo Restaurant offers. Even lounging in the privacy of the boutique rooms will mean a moment to experiment thanks to the careful decoration, the equipment and all the features that the room makes available to the guest. Stay in one of our spacious and bright rooms Twin Room or Double with Balcony, for the rest of a day full of emotions in which the discoveries of the day of the most emblematic tourist destinations of all our heritage have left you exhausted but have eaten your desire to discover new horizons. 2 tickets for the Caminito del Rey (*). Our hotel is responsible for making all the necessary reservation arrangements to put at your disposal the tickets so that you only have to prepare to enjoy the risky views of the vertiginous gorges of Caminito del Rey. Cataloged as the most dangerous path in the world is an experience that you can not stop living during your visit to Malaga. A trip for 2 people to a tourist town (*). On the Costa del Sol the options are endless. From any of the emblematic white villages of the interior of Malaga (Frigiliana, Casares, the villages of the Serranía de Ronda and the Sierra de las Nieves are just some but there are a thousand more). Until the wonderful coastal towns of the coast of Malaga. The luxury of Marbella, the magic of Mijas and the cliff landscapes of Nerja are just some examples. In addition we will surprise you with surprise gifts of attrezzo and courtesy drink to enhance the adventurous experiences in this experience of which we will take care of everything you need so that you can practice an active tourism and tone up during this getaway. Breakfast included in our exquisite Paris Tokio restaurant. A gourmet complement to replenish the energy of the adventures lived and to live thanks to a varied culinary selection that by itself will suppose another additional trip to diverse cultures through all the flavors that our continental buffet offers. In short, this experience completes the emotions of living the adventure of visiting the most dangerous path in the world, making available a complementary offer to enjoy every moment of the getaway. But these are just a few reasons why choose the El Tiburón Boutique Hotel as the hotel to stay and not other hotels in the Caminito del Rey if you want to live an experience for the most demanding explorers of emotions. If adventure is your thing and being immersed in nature it drives you crazy, do not hesitate, and escape to our El Tiburón Boutique Hotel.